Image: George Pimentel/Getty Images, Nicholas Hunt/Getty Images, Mike Marsland/WireImage/Getty Images, Julien Hekimian/Getty Images. Design: Allison Kahler/StyleCaster. When it comes to red carpets, celebrities' bags are the last thing on people's minds. When there are dresses and shoes and hair and makeup to fawn over, purses often become an afterthought, which is why celebrities are known to ditch them or carry simple, not-too-flashy clutches. But there are some stars who play the game and don't ignore the magic that bags can create on a red carpet. Ahead, we've collected 13 times celebrities have carried offbeat handbags on the red carpet. These famous ladies aren't afraid of an out-there accessory, from bringing an actual bottle of wine (looking at you, Gigi Hadid) to toting handbags shaped like lipsticks. Jolie made handcuffs fashion when she wore a gold Louis Vuitton clutch with a matching cuff to the premiere of her then-husband Brad Pitt's movie Moneyball in Toronto in 2011. The $15,000 bag featured a shiny gold exterior, but the real star was the gold cuff that was linked to the bag with a gold chain. Image: Nicholas Hunt/Getty Images for The Business of Fashion. 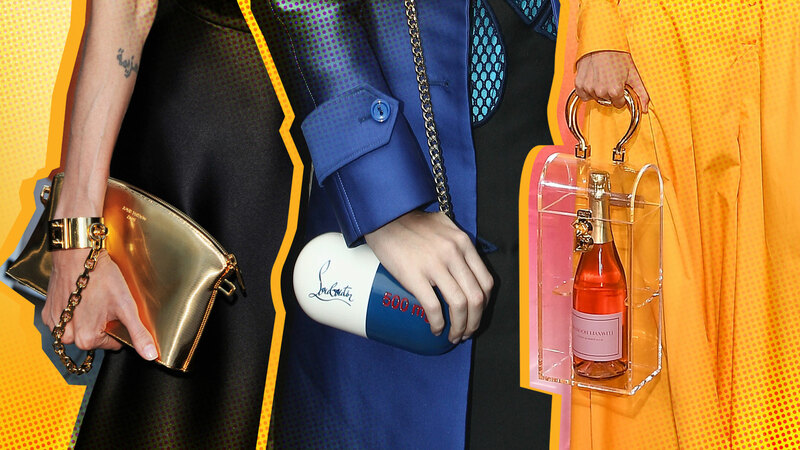 Hadid made headlines in 2018 when she carried a bottle of rosé in a clear case to Brandon Maxwell's show at New York Fashion Week. 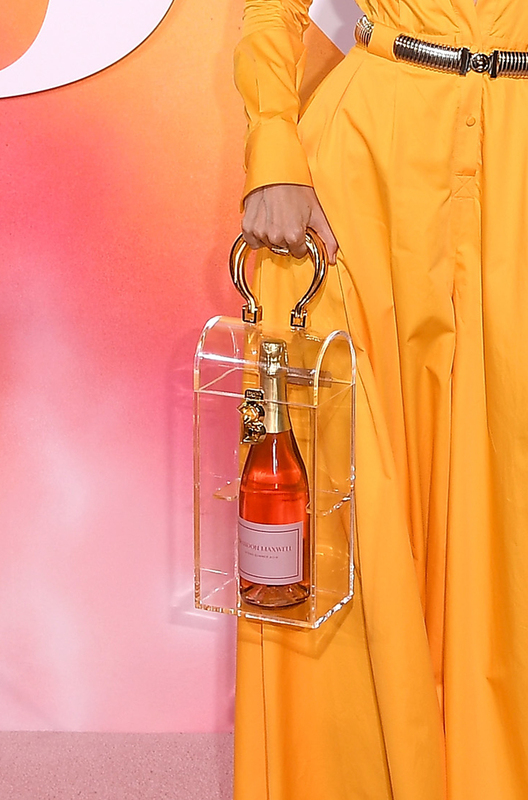 The bag, which was designed by Maxwell, featured a top handle and a tall case that carried a sealed bottle of sparkling rosé. Image: Mark Robert Milan/GC Images/Getty Images. The Game of Thrones star looked comfy-chic when she wore a lips-print dress with a triceratops-shaped bag at a Prada event in London in 2014. The bag featured a shiny silver triceratops plush with a collar attached to a wide black shoulder strap. In her 30-plus years as an actor, Carter has played several queens, so it makes sense she brought a castle-shaped bag to the premiere of Harry Potter and the Half-Blood Prince in London in 2009. 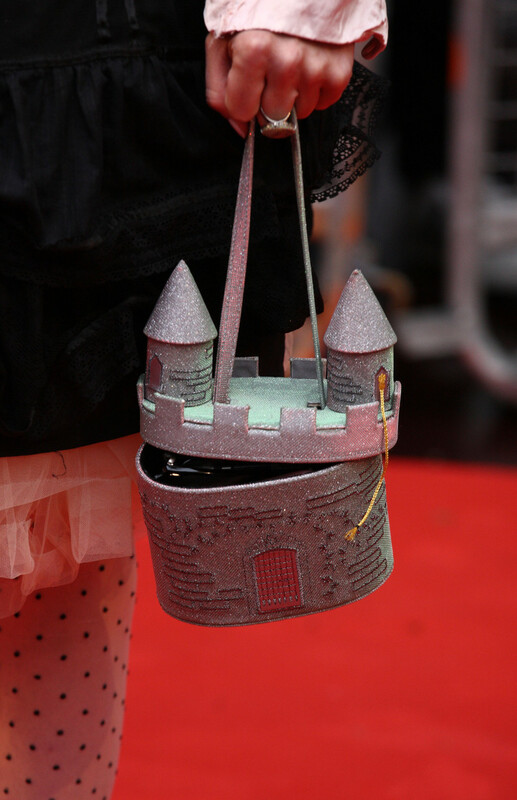 The bag featured a glittery castle with bricklike details and a door. The roof of the castle, which had a matching strap, was removable, allowing for Carter to put her items in the castle's body. Image: David M. Benett/Getty Images for Pandora. For a Pandora event in London in 2014, Jamil brought a Coca-Cola can on the red carpet. The bag featured a can-shaped chest, which included a lock and the iconic Coca-Cola logo on the outside. The bag also had a handle made of red pearls. Perry accented her blue ensemble at Viktor&Rolf's show at Paris Fashion Week in 2012 with a blue-and-white pill-shaped bag. The bag, which was Christian Louboutin, featured a half-white, half-blue pill, with Louboutin's signature and "500 ml" emblazoned on it. Attached to it was a long gold chain, which Perry slung over her shoulder. 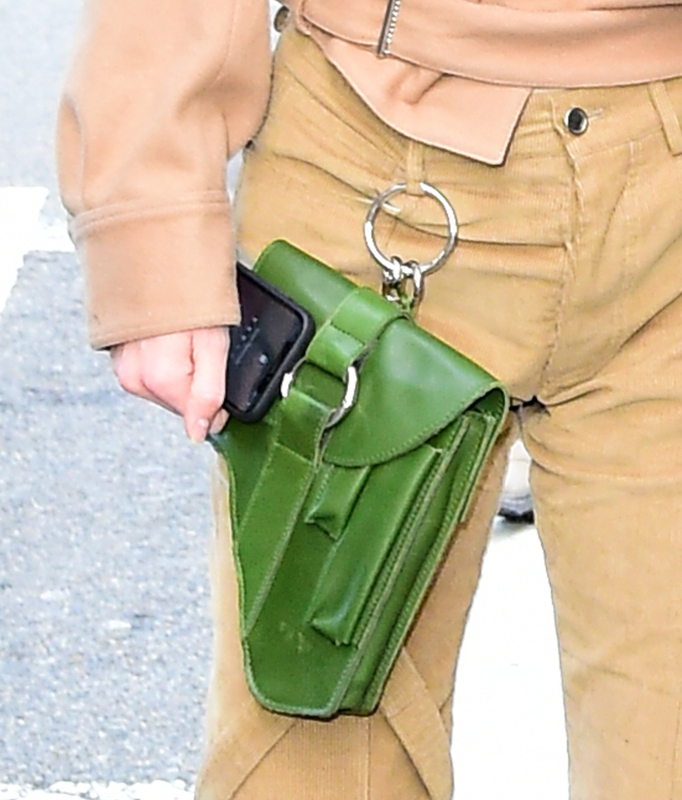 Jenner made a statement when she was seen with a gun bag in New York City's Soho neighborhood in 2018. The bag, from the brand Private Policy, featured a green leather-like satchel, which looked like it was shaped to hold a gun. Jenner wore the controversial accessory around her belt loop. Gaga is known for her out-there accessories (remember her meat purse? ), but her telephone bag is one of our favorites. The singer wore it in New York City in 2011. The red bag featured a dial with numbers as well as a long red cord with a receiver attached to it. Aldridge highlighted her Met Gala 2015 dress with a koi fish clutch designed by Judith Leiber. The bag featured intricate details, including bedazzled scales, an eye and a small blue-and-white fin for Aldridge to put her finger through. Image: Philip Ramey/Corbis via Getty Images. Allen has been photographed with her Chanel Russian doll purse on many occasions. The bag, which the singer wore in this picture in London in 2009, includes a small doll with a babylike face, a flower in its hair and three Chanel symbols that resemble buttons. It also includes a chain attached to the head, which can be screwed off to hold one's belongings. Nyong'o is also a fan of Leiber's clutches. She wore one of the designer's bags to the 2018 Accessories Council Awards in New York City. 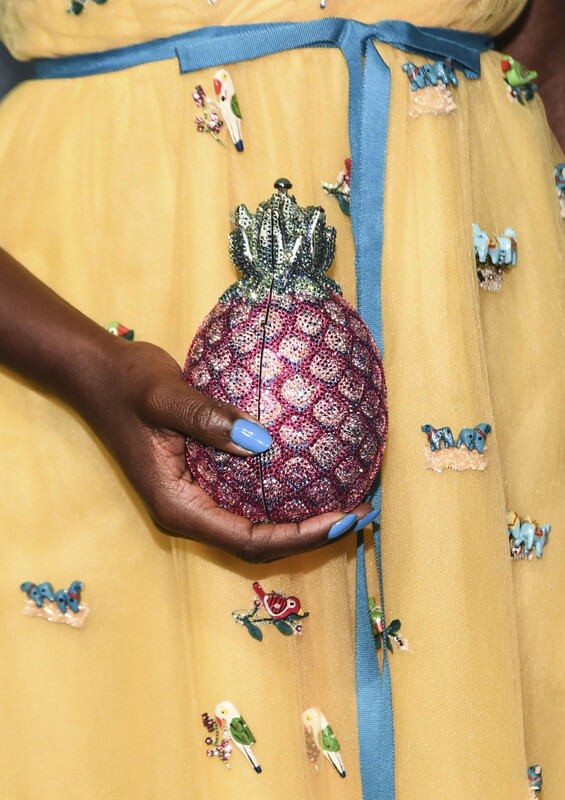 The bag was a bedazzled pineapple, which Nyong'o could split in half to put her belongings in via the button on top. Williams turned heads on the red carpet when she wore a purse in the shape of the 1951 book Catcher in the Rye to the Independent Spirit Awards in Los Angeles in 2012. 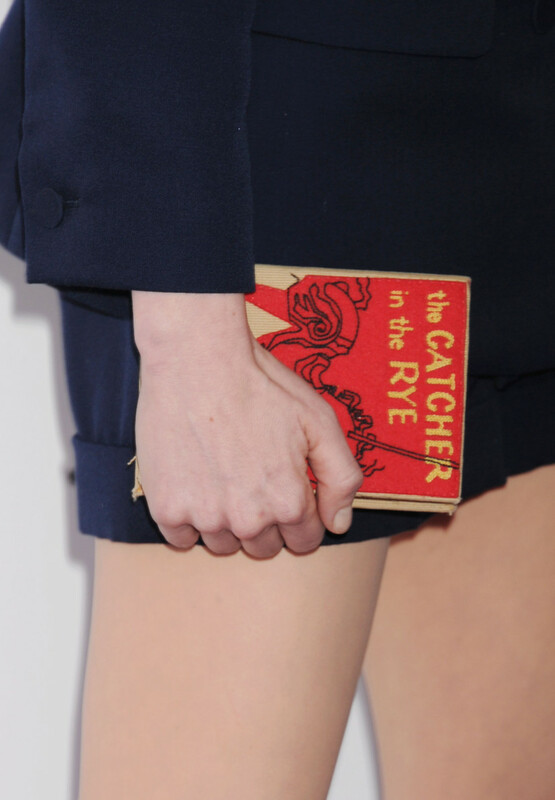 The bag, designed by Olympia Le-Tan, looked like an exact replica of Catcher in the Rye — except instead of pages, it could open in the middle to hold Williams' belongings. Jamil wasn't the first celeb to celebrate their love of a cola brand on the red carpet. 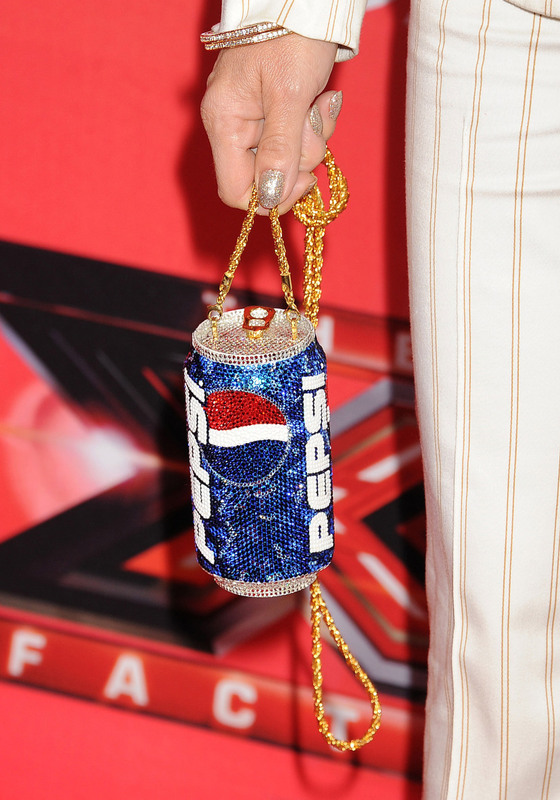 The singer carried a bedazzled bag in the shape of a Pepsi can to a press conference for The X Factor in 2011. The bag was an exact replica of a Pepsi aside from the jewels and the gold string on top, which Abdul used to carry it.